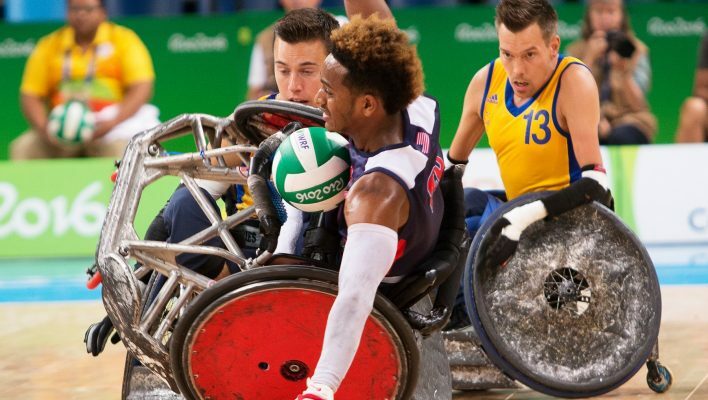 Rio De Janerio, BRAZIL – Fueled by their 51-42 opening win over France, Team USA came out strong on the court for day two of the Wheelchair Rugby Competition at the 2016 Paralympic Games with a commanding 54-44 win over Sweden. The first period saw the U.S. capitalizing on six turnovers from Sweden to take a four point lead, finishing up the first 14-10. Strong teamwork from the line of Chuck Melton (Richview, IL), Adam Scaturro (Lakewood, CO), Josh Wheeler (San Tan Valley, UT) and Eric Newby (Littleton, CO) opened the second period for the Americans allowing them to keep up their four goal lead. The line change for the U.S. to Chuck Aoki (Minneapolis, MN), Kory Puderbaugh (San Diego, CA), Chad Cohn (Tucson, AZ) and Lee Fredette (East Moriches, NY) brought on an aggressive offensive effort widening the margin to eight. As the Americans continued to mix in the lines the lead built again and at the end of the half it was the United States 29, Sweden 19. The second half of play mirrored much of the first with the Swedish team fighting to narrow to gap. Despite their efforts, the Americans remained on top with another slight increase in their lead, going into the final period ahead 42-31. Veteran players Jason Reiger (Centennial, CO) and Seth McBride (Portland, OR) with Paralympic newcomers Newby and Josh Brewer (Battle Ground, WA) took the court to open the fourth widening the margin ever so slightly again as the American were up 47-35 with just six minutes of play left in the match. Final score of the game, the U.S. 54, Sweden 44. Top scorers for the U.S. were Josh Brewer with 15 and Chuck Aoki with 14. Pool play continues on Friday, September 16th with the U.S. vs. Japan, currently third in IWRF rankings. Semi finals on the 17th lead to the medal matches on Sunday the 18th, the last day of competition at these Games. Team USA is now 25-2 in Paralympic Competition having been on the podium in every Games since the introduction of the sport at Sydney 2000 with two golds (Sydney 2000 and Beijing 2008) and two bronze (Athens 2004 and London 2012). The United States regained their title as the number one team in the world at the recent 2016 Canada Cup.